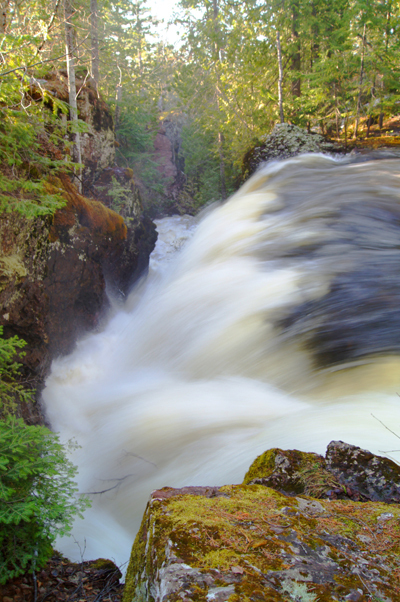 The Copper Harbor area, as with many areas of the Upper Peninsula has waterfalls that are hidden treasures. Some are right along the roadways while others take a little more foot power to reach, but are well worth the effort. They are all magnificent, especially during spring runoff when white water is rushing to the lake, or as frozen sculptures in winter. Manganese Falls – Take 2nd Street (Manganese Rd) 1/2 mile south of Gratiot street and just off the road to the left. An easy trail leads to a nice viewing area. Another trail parallels the falls for some great up close views. The falls are of course best in the spring but the area is pretty any time of year. There is a small but pretty falls and cascading river that can be viewed from the John Lincoln Green Trail bridge. Silver River Falls – 9.5 miles west of Copper Harbor just off the road. A few steps and an easy trail leads to these falls. The Silver River runs under M-26 and a pretty stone bridge crosses just after the falls. Jacob’s Falls – 18 miles west of Copper Harbor just beyond Great Sand Bay and just past the Jam Pot on the left. Or 4 miles east of Eagle River just before the Jam Pot. Eagle River Falls – Turn by the County Courthouse to view this historic Fuse Factory Dam in Eagle River. Haven Falls – Turn right at Gay-Lac La Belle Road about 1/2 mile, at the County Park on the right. This is a nice picnic area and rustic restrooms are onsite. Montreal Falls – Montreal River, 5 miles east of Bete Grise along the shore of Lake Superior. Copper Falls – On Owl’s Creek, between US41 and Eagle Harbor, on the Eagle Harbor Cut-Off, 1/2 mile off road.